“Who are these people and how are we related?”!! Being the next to the youngest child on both my mother and my father’s side of the family caused me to ask this question often as a young child and later in life. Always being the inquisitive one, I am the keeper of the historic documents and photos on my father’s side and some of the precious old pictures from my mother’s side. About twenty some years ago I began my quest of trying to visually create the “Family Tree”. I began when the technology age was expanding and there was software to capture the information that I had, in a beautiful format. I remembered I had spent hours entering data from a Stone cousin on my Dad’s side that had researched in the traditional way by finding ancestors through genealogy libraries around the country, courthouses, cemeteries, and churches. She was the generations born in the early 1900’s who was already trying to preserve the past with research, personal recollections of elders and from family Bibles in hopes of being able to share with the future generations. I was fortunate enough to have my parents direct this relatives as well as others to me with their sheets of research because they knew of my interest. I used the research I had and the CD’s of software that was available at the time. But the software was limited. It did not have the on-line features that are out there now. The software contained records for census, birth, marriages,and deaths, basically. Then I lost all my early work when my desktop computer crashed when our house was struck by lightning and unfortunately for me this was before I was aware of backing up my work. I put this aside after life got busier with children and work. I checked in for short periods of time with Roots Web and Ancestry.com as they came out with the advancement of the “worldwide web”. It was fascinating how much information could be found , to see other family trees with which I had common interest, and see ways to post questions. About two weeks ago, I decided to once again go “on-line” with Ancestry.com and see how much it had changed. Wow! I basically recreated what I originally had before, plus much more with just a few clicks of a key. I was very impressed how information could be accredited with primary and secondary sources so easily. There are many ways to collaborate through sharing pictures, personal stories, and publications. I know there are other ways and there are genealogy clubs everywhere to build family trees as well as less expensive ways, but how could it be easier than from at home whenever you have the time. My story is a common story: I grew up in the midwest on a farm. 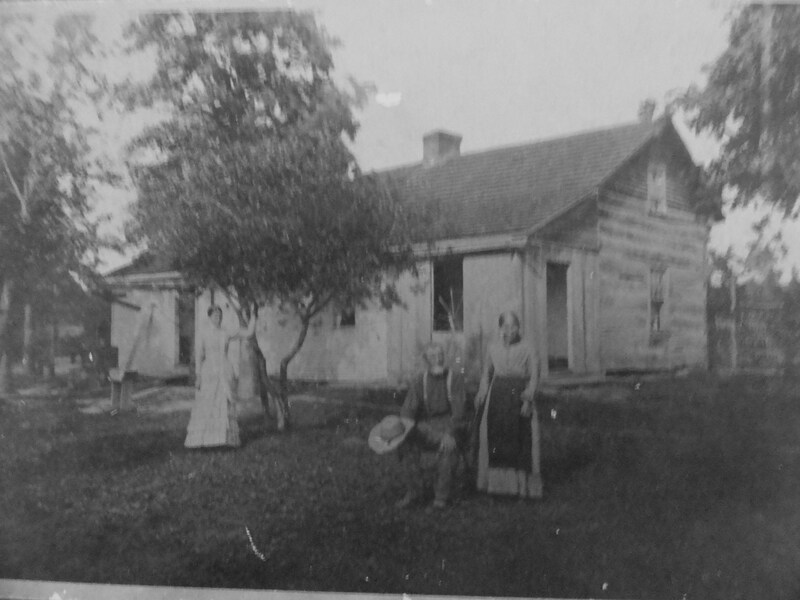 As with most early American families moving west my ancestors were subsistent farmers, primarily and worked in the logging camps in the winter. The German and Swiss side of the family came as far as Ohio and stayed there for a couple of generations and then one family bravely sought their luck in Michigan about 60-70 years after statehood. They traveled several hundred miles north into the lower peninsula of Michigan by horse and carriage. 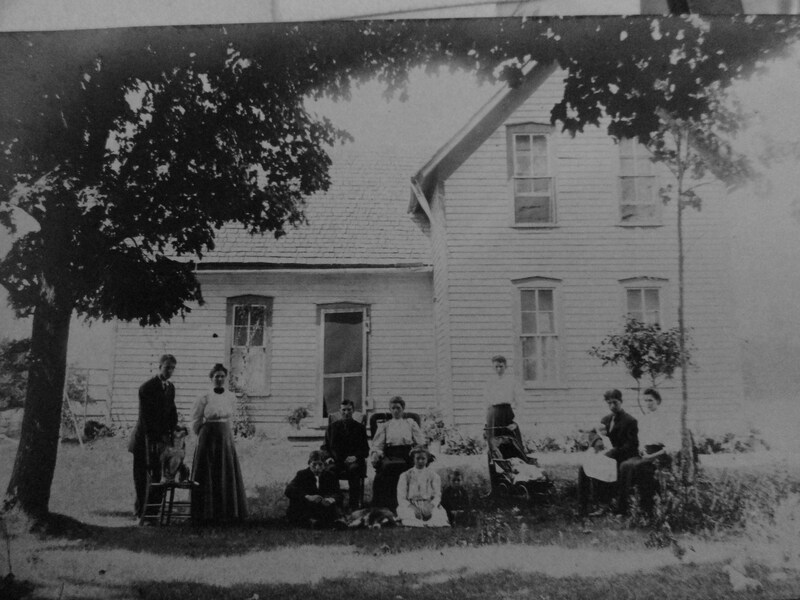 They were carpenters as well as farmers, which was handy and established themselves in Benzie County. As their families grew they too, married and raised their families “down the road” and continued the carpenter trade as well as other vocations. In the 50’s and 60’s most of my relatives lived in two areas of the county. That stayed that way for about three and four generations, then as families grew and opportunities expanded, they also began to relocated in Mi and other states. To continue the story of my quest for more information about my family, I found one postcard, yes, one postcard with the Chicago address of my great grandparents. I was so excited, because my Dad and his brothers could only generalize about the location. When I found the address my curiosity was not satisfied. 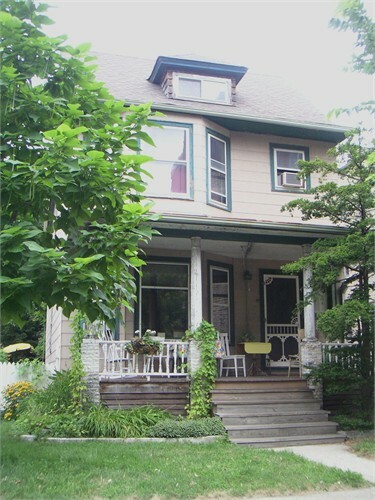 So about 5 years ago, I took a college friend and lake friend to Chicago in quest of this house. I located the address on Map Quest. We decided to go spent a couple of days in Chicago looking for the house and seeing if it still existed. Then go to the art museum and do a Frank Lloyd Wright tour. And who could have guessed it was also Venetian Festival that same weekend in Chicago! Wow! A plethora of things to do! Once in Chicago we got off the 90/94 Freeway and took a main street for several blocks north to get the feel of the area. It was very Bohemian and diverse now. I chuckled as a few streets we passed as we closed in on the location were coincidentally family first and middle names: Addison, Caldwell,Lincoln, and Irving. Once we arrived at Wilson Ave. in Lincoln Park my friends watched while I drove and managed the lights and traffic. We found the house! It was still there. The blocks to the east were now office buildings or apartments, but the family house was still there! I had a picture with me of my grandfather with his family sitting on the front steps for a family picture. The front porch of the house was structurally still the same as it was a hundred years ago and some architectural details around the front door were the same. I timidly knocked on the door, not knowing what to expect: someone friendly or an ax murderer. Well it was a young widow who cautiously answered the door and listened to the story of my quest. She told me that when she and her husband bought the house twenty years ago, its interior was still the vintage Victorian design and had not been changed much by previous owners nor by themselves. She was not willing to let some strangers from MI have a tour of the inside but was fine with us snooping around the small backyard and taking pictures. That visit filled the void and wonderment I had from the very first time that I found out that my grandfather had grown up in Chicago, not Benzie County. This story could continue but I will save more for another blog. Oh my gosh! Why would people want to live any place other than NW Michigan or move away from their family to some other place! Ha! And here I am, doing just that. I have been living for one year away from my family in NE Wisconsin. I thought that it would be more difficult than it has been or wonder when it will really dawned on me . I am fortunately only one car ferry trip or one long day’s drive away, so I have been back to see family and do business often. But the distance has put the mind into memory mode often of immediate family,grandparents, aunts, uncles, cousins and second cousins which I guess is termed cousins once removed, I think. I told someone a few weeks ago it was so nice and surprising to have people recognize me when I was home. The excitement and new places to explore make up for the once knowing most people in the county because you are related to them or have had them or their children in the classroom. It is a luxury of familiarity that is absent once you relocate, but being able to go home periodically soothes those feelings.